For most parts of the world, fall has made its grand entrance and is here to stay. While the thought of saying goodbye to warm summer days and hello to chilly temperatures may not get you excited, I bet thinking about next season’s fashion trends will! Instead of jumping right into buying heavy knit sweaters, chunky socks and corduroy pants, how about something that you can wear right now? Already showing up in numerous fashion editorials, it looks like loafers and oxfords have been deemed the “it” shoes this fall! For ideas on how to wear these menswear-inspired shoes this season (and next), I’ve gathered some outfit inspiration from one of my favorite street chic websites, Lookbook.nu. If I could only invest in a single pair of loafers this season, they would have to be leopard print (such as the ones worn above by fashion blogger Maddy). I’m constantly searching for ways to shake up my outfits and I think that a great place to start is with your shoes. As much as I love Maddy’s pale pink accordion pleat skirt, the real star of this ensemble is her animal print loafers. They’re interesting, unique and daring! When working leopard print loafers into your daily style, try pairing them with neutrals or ultra bright hues (like orange skinny leg jeans!). I love color -- and what better way to incorporate it into an outfit than with a pair of hot pink loafers? For a foolproof way to wear vibrantly-colored shoes, here’s my advice: go bold or go home! Stephanie’s outfit above, featured on her blog High Stitched Voice, is a success because it’s balanced with both pastel and punchy hues. To contrast her coral blouse and mint jeans, she selects a pair of pink loafers as the point of interest. The thing that I most love about oxford shoes is that you can wear them with just about anything. A simple leather oxford is the perfect complement to fashion blogger Nany’s white crochet shorts and denim shirt. To keep her outfit from becoming overly feminine, she opts for a pair of tomboyish oxfords and a tied shirt with rolled-up sleeves. It’s nearly impossible to talk about oxford shoes without mentioning the cool, tomboyish vibe that they can add to an outfit. Bonnie Barton of Flashes of Style fully knew what she was doing when she paired her frilly blouse and casual shorts with two-toned oxfords. While a timeless pair of ballet flats would have done the trick, why not change it up a bit with some brogues? If you’re looking for a loafer that you can mix and match with a ton of outfits, then black is the way to go. Sure to look amazing with everything from a cuffed pair of jeans to a pleated skirt and blouse, these black velvet loafers are a winner! Forget conventional, how about quirky and fun?! Nothing makes me happier than a pair of shoes that have a punch of personality. These loafers by Splendid are too cute and the stripes and playful color palette will surely keep you on your toes! Kate Spade always manages to amaze me with their classy and fabulous designs. A sparkly loafer is just what you need to add some panache to any ensemble. Show up to class in these, and all eyes will undoubtedly be on you! If you thought that oxfords were only for boys, think again! Topped with a floppy pink bow, these white oxfords have girly-girl written all over them. Just think of how precious they would be when paired with a floral skirt or a ruffled dress. Looking for a quick and easy way to jazz up your favorite black dress or skinny leg jeans? Well, Dolce Vita just so happens to have the perfect shoe. Covered in black and white spots, this pair of eye-catching oxfords is sure to fit the bill. I talk a lot about tried-and-true wardrobe staples that every girl should invest in. Well, here I go again ... Madewell has designed a lace-up oxford that you will wear for years to come. For a vintage-inspired ensemble, pair these with a white lace frock or a cool fringe vest and a maxi skirt. Once fall rolls around, don’t hesitate to wear them with ribbed tights, or better yet, chunky knit socks! Whether you love the menswear-inspired look or just want to a try on a new shoe (literally! 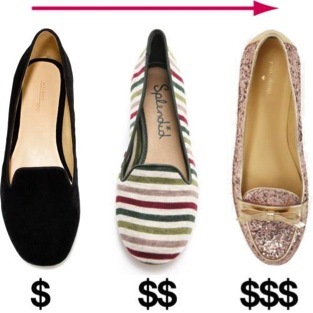 ), there’s no harm in investing in a good pair of loafers or oxfords.